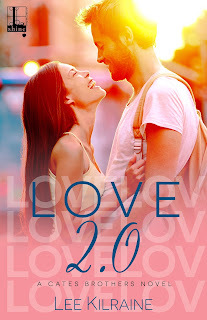 Dog Eared Publicity: Cover Reveal: Love 2.0 by Lee Kilraine, coming November 14! Cover Reveal: Love 2.0 by Lee Kilraine, coming November 14! Elvis has been spotted in the little town of Climax, North Carolina. Or at least, a shapely female Elvis impersonator—who’s got Kaz Cates all shook up . . .
Kaz is having one of those days. Cyber criminals, federal agents . . . and now, Elvis. In reality, the King is Mirabel Diaz, earning money by delivering singing telegrams. But Mira’s got another reason for being here: she knows Kaz Cates is secretly a master hacker with the skills to help people disappear, and that’s exactly what she needs to do. Still, Kaz can’t help wishing she’d stay awhile . . . This isn’t Mira’s preferred career—her singing voice isn’t even that great—but her ex-boyfriend, a powerful Russian gangster, hasn’t left her a choice. No matter where she runs, he seems to find a way to pull strings and get her fired. If she doesn’t get off the grid, his vengeful acts may only get worse. Kaz reluctantly agrees to help, and insists on teaching her self-defense. Though she’s afraid to trust any man, she feels safe with Kaz . . . and welcomed by his family. But if they don’t stop the danger that’s chasing her, she may have to go on the road again instead of finding a haven in his arms . . .